EDITOR’S NOTE: In this RealClearBooks series, RealClear Book of the Week, we highlight recent nonfiction books from across the political spectrum. 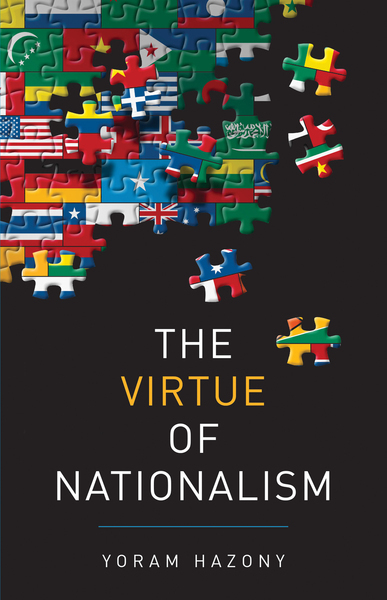 This week’s book is Yoram Hazony’s “The Virtue of Nationalism,” published this month by Basic Books. When people hear the word “nationalism” today, their minds frequently turn to the disasters of 20th-century Europe. Like racism, nationalism is thought of as an irrational condition reasonable people would like to move past. But in his new book, “The Virtue of Nationalism,” Dr. Yoram Hazony, director of the Herzl Institute in Jerusalem, argues that nationalism is actually the best kind of political organization. Hazony has recently been a frequent contributor to the Wall Street Journal, and has written books on reading the Bible as philosophy, Israel, and politics. In his new book, Hazony aims to detach “nationalism” from its negative connotations. For Hazony, it is not an irrational psychological condition, but a particular political order in which the world is divided into independent nation-states. If Europe, for example, were reorganized around nationalism, no state power would have been ceded to the European Union. There would be no higher power than the nation. Hazony argues that such a world presents the best kind of political order. Hazony traces a historical opposition between nationalism and imperialism going back through Western civilization to the Roman Empire. According to him, an order of nation-states eventually emerged in contradistinction to idea of a Christian empire. Ultimately, Hazony sees the political life of Europe as resting upon two principles: the fundamental ethic by which all states ought to secure personal freedom for their subjects and the right to national self-determination. Those who feel a love of country may be pleased to find a book that articulates the virtues of political independence. And an argument for nationalism may reinvigorate a debate that skews heavily toward arguments in favor of international organizations. For those who are already in favor of nationalist order, Hazony will provide some provocative questions and ideas. But for those who come to this book thinking that nationalism ought to be superseded, his work may seem under-argued and unpersuasive. For example, Hazony argues that the nationalist order undermines imperial conquest, promotes individual liberties, as well as technological, scientific, and artistic progress. However, the historical and political argument necessary to thoroughly justify these views is missing. Hazony, nevertheless, succeeds in making “nationalism” intellectually serious. Convincing arguments against nationalism will have to contend with Hazony rather than simply assuming its time has passed. Max Diamond is an investigative reporter at RealClearInvestigations.